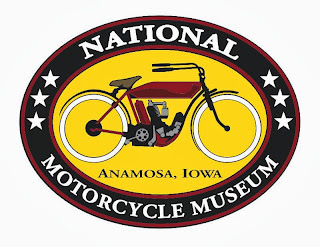 Fundraiser for the National Motorcycle Museum in Anamosa, Iowa. A GREAT GIFT FOR MOTORCYCLING FRIENDS AND FAMILY MEMBERS! Through fine old photographs, each month the Vintage Wind calendar commemorates the golden age of motorcycling. The calendar, a fundraiser for the Museum, brings you a variety of classic bikes, just like what you'll see when you visit the National Motorcycle Museum in Anamosa, Iowa. This year's calendar includes Reading Standard, Henderson, Indian, Excelsior, Dayton, along with numerous Harley-Davidson models. Plus, with monthly event listings you'll keep up-to-date on all those important vintage motorcycle related events throughout the year, dates for shows, rallies and swap meets nationwide. 12-month calendar. 11 x 19 inches when open. Each calendar you purchase helps the Museum create new exhibits, improve information on each bike as well as install additional video monitors to play vintage motorcycle films. Click here to order your Vintage Wind Calendar! As the performance of an engine is increased, eventually a weak link is found and something fails. 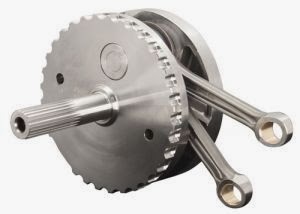 One such weak link is the stock flywheel assembly in 1999-to present Harley-Davidson® big twins. If you really put the hammer down, the stock wheels tend to shift out of true. 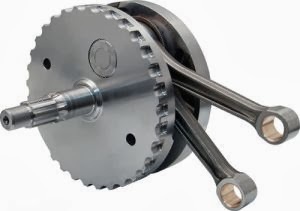 These assemblies are all new, with integral sprocket and pinion shafts, an all new connecting rod and crankpin, and superior materials for added strength. They are a vast improvement over stock, and are even superior to S&S flywheels to date. •Designed with increased cross-sectional area for increased crank-pin clamping force – No welding required! •Capable of higher rpm – More available power!